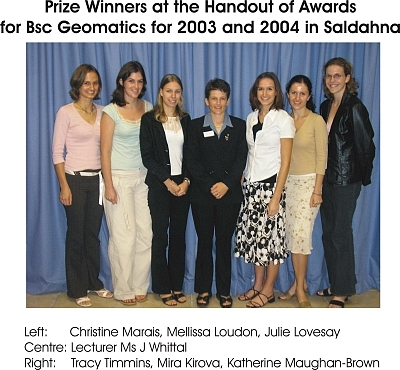 Ms Jenny Whittal, Programme Convenor of the BSc Geomatics in the Division of Geomatics at University of Cape Town (UCT) presented the student awards for 2003 and 2004 at the inaugural SAGI meeting in Saldanha in April 2005. Congratulations go to the prizewinners! Here is some feedback from the top-performers …. Mellissa Loudon: Class Medals – Best 2nd Year Student of Geomatics in 2003, Best 3rd Year Student of Geomatics in 2004, Ivor West Memorial Prize for the Best 3rd Year Student in Geomatics in 2004, SA Photogrammetry and Geo-Information Book Prize awarded to the Best Student in Photogrammetry and GIS, 2004. Tracy Timmins: Class Medal for the Best Final Year Student in 2003, SA Photogrammetry and Geo-Information Book Prize awarded to the Best Student in Photogrammetry and GIS, 2003. "I completed a B.Sc. 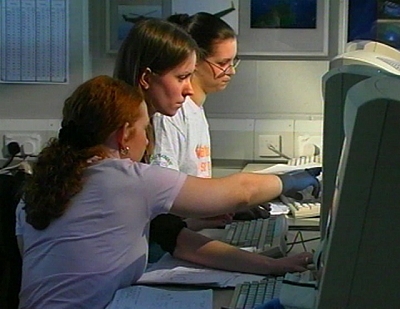 in Geomatics at UCT in 2004, with a focus on GIS and Environmental Science within the Geoinformatics stream. The diversity of the skills which I acquired during my undergraduate career has given me a sound background to my current field of study: Masters in City and Regional Planning. The Geomatics Programme at UCT has provided me not only with extensive support and a wide choice in terms of specialisation, but also with the confidence that I am well prepared to face the corporate world. I feel privileged to have been exposed to the expertise of the knowledgeable and inspirational staff of the Geomatics Department." Katherine Maughan-Brown: Class Medal - Best 4th Year Student of Geomatics in 2004, George Menzies Prize for the Best Final Year Student of Geomatics in 2004. Geodesy (the measurement of the size and shape of the earth), fascinating since the time of Erathosenes, became a basic science for the space program. 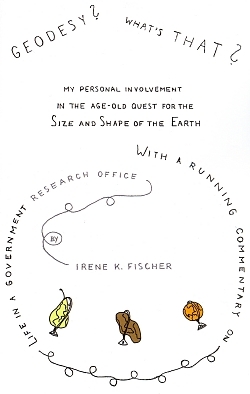 Irene Fischer was a leader in the construction of the World Geodetic System (has an Earth reference ellipsoid named in her honor) when it was still being done by surveyors, piecing together terrestrial, gravitational and astronomical data. By the 1970s, satellite geodesy and marine geodesy were just coming into their own. Using her career, Fischer revels in explaining how the science unfolded, and how misunderstandings occur across scientific fields, e.g., why the “standard ocean” and the geoid do not easily translate across the fields of oceanography and geodesy. Her account should appeal to those writing the history of women in science. Government science, too, is less well studied than academic science even though some fields, such as geodesy, were always government led. Fischer provides food for thought, as well, to those who claim to study the management of science in bureaucratic settings different from those of industry or academia. Peppered among these themes are Fischer’s solutions to historical mysteries such as why Columbus’ used a figure for the size of the earth’s circumference that was so much smaller than Erastothenes’ or Posidonius’ (with the added benefit of making it easier to persuade his patrons). Irene Fischer is an internationally renowned geodesist and member of the National Academy of Engineering. Culture has a number of meanings and uses within organisation theory and is a “slippery and elusive” concept. It is used to try and indicate the “climate and practices” developed within an organisation to handle people, together with the values of the organisation. The concept of culture is drawn from organisation theory, sociology, anthropology and political science and can be complex and interpreted in different ways. One of the familiar definitions comes as “the way we do things round here.” Handy (1985) in explaining culture, talks about “different atmospheres in organisations, different levels of energy, of individual freedom, of kinds of personality.” Strati (1992) explains how culture is expressed through symbols, beliefs and patterns of behaviour, its ceremonies and quality and conditions of working life, as well as jargon and lifestyle and physical appearance of an organisation’s members. To examine and unpick a culture is difficult. Organisations are complex and may consist of a number of subcultures. How gender impacts on culture will depend on many other indicators such as age, race, and occupation. Comparative studies of education can throw a new light onto pedagogical practice offering new solutions to common issues. However Broadfoot (2001) warns, it can be dangerous to borrow successful practice without considering the impact of the local and complex factors at work influencing the outcome of actions. The local factors include the students, the learning situation, the institutional ethos (or culture) and the regional and national policies that influence a culture. As long as these factors are considered a comparative study can help to understand issues that cross national boundaries and are important for education. It is this context that this small study attempts to provide an insight into. The researchers intend to examine the similarities and differences that occur within built environment higher education culture and the impact of that culture on the women participating. The research within the UK has been undertaken as part of an ongoing doctorate in education, whilst the research in Australia has been undertaken by an academic newly arrived from the UK. The methodology was qualitative, and data collection consisted of interview, together with the examination of secondary data sources which could add to the over all picture. The researchers within the study do not hold the position of objective outsiders. Both researchers are female academics working within a male dominated working environment. Objectivity is maintained by critical questioning of results, and the investigation of the relation between subject and object rather than by denying the existence of it (Harding, 1991, p152). What is the Culture in Surveying Higher Education? The built environment professions have been an example of a segregated area of study and work in the UK and in Australia as well as other countries. Research on the culture of construction has been limited, but research on the culture of the SET (science, engineering and technology) professions in general has received attention in UK and Australia (Greenfield, 2002; George, 2005) and the difficulties that construction faces in trying to change its white male dominated profile have been analysed (Greed, 1991 & 1999, Turrell, Wilkinson, Astle and Yeo, 2002). 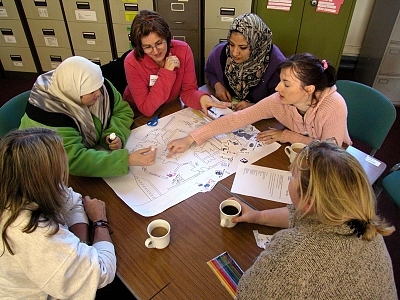 The shortage of women (and others) entering built environment careers has been identified as a concern in UK and Australia (OST, 2003; DEST, 2002). Measures to increase numbers and promote the careers and professions may not be sufficient. The reasons occupations remain gender segregated is complex and concerns have been expressed in both the UK and Australia. Both countries are experiencing shortages of women entering this sector and existing initiatives are not considered sufficient to redress the imbalance. Academic culture is thought to closely mirror the professional and industrial culture within disciplines and the attribute, when previously measured were overwhelmingly masculine in the built environment. The initial research reveals cultural differences exist between the two institutions based on age, size and mission. The UK institution is a former polytechnic with its history rooted in vocational provision whereas the Australian institution is a research intensive body and the second oldest university in Australia. Theses characteristics clearly affect culture. Higher than average numbers of female students and higher numbers of international students are enrolled on the UM ABP courses and this affects the culture significantly too. However similarities exist also and this relates primarily to the position of females within the institutions and their levels of seniority. Similar perceptions exist around culture of the Faculty’s in each university and the perceptions of students of female staff and work-life balance issues. Becher, T. (1989) Academic Tribes and Territories: Intellectual Enquiry and the Cultures of Disciplines, Society of Research into HE, Open University Press. Becher, T., Trowler, P. R. (2001) Academic Tribes and Territories, Society of Research into HE, Open University Press. Broadfoot, P., (2001) Editorial: Culture, Learning and Comparative Education in Comparative Education, Volume 37, No. 3 2001 pp 261 – 266. Greed, C. (1999) The Changing Composition of the Construction Professions. Occasional Paper, Bristol: University of the west of England, Faculty of Built Environment. Greenfield, S. (2003) SETFAIR: A Report on Women and Science, Engineering and Technology to the Secretary of State for Trade and Industry. Harding, S. (1991) Whose science? Whose Knowledge? Thinking from Women’s Lives, Open University Press, Milton Keynes. Paechter, Carrie (1998) Educating the Other, Gender, Power and Schooling, Master Classes in education Series, The Falmer Press. Pilcher, J. (1999) Women in Contemporary Britain, An Introduction, Routledge. Smith, R (1999) Equal Measures in Building Magazine, p102, 26 February 1999. Turrell, P, Wilkinson, S, Astle, V and Yeo, S (2002) A Gender for Change: The Future of Women in Surveying, paper presented at FIG XXII International Congress, Washington D.C., U.S.A. April 19-26, 2002.